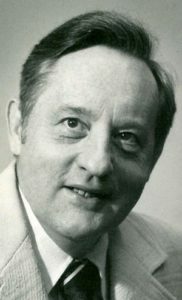 Richard J. Frey, “Pinky”, 94, of Millersville, passed away Thursday, January 31, 2019 at Hospice & Community Care, Mount Joy. He was born in Highville, Manor Twp. to the late Mae Frey Mann, and was the stepson of Cyrus C. Mann. He was the husband of Nancy M. (Gregg) Frey for 71 years. A 1942 graduate of Penn Manor High School, he entered the Army in March 1943 and went to basic training at Fort Sill, OK and Camp Shelby, MS. He was shipped to England and joined Battery B, 19th Field Artillery Battalion. Next went to Northern Ireland for more training. Entered the war zone on July 9, 1944 on the Normandy Coast. He served as radio operator and jeep driver with forward observers until the end of the war. 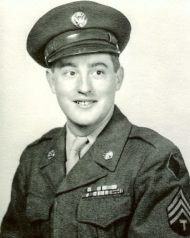 He was discharged from 5th Division at Camp Campbell, KY in October 1945, with the rank of Tech-5, having received five Battle Stars and the Bronze Star. Pinky started working with Lancaster architect Henry Y. Shaub, and then worked as registered architect in the engineering department of Armstrong World Industries for 25 years. He was a member of St. Joseph Catholic Church and was previously involved in the Society of St. Vincent de Paul. He helped design and renovate several of the buildings at St. Joseph Church, in particular the Chapel. Pinky was the Best Dad in the World. He made small, personally designed greeting cards, over 2000 in his lifetime, as well as miniature bird houses, personally designed crafts and ink drawings. He made his own version Cat’s Meow of the Churches, College buildings and the homes of his family members. A lover of Jazz music, he played the clarinet and saxophone. In addition to his wife Nancy, Pinky is survived by their four daughters: Nancy E., wife of George Biechler of Wyomissing, Susan L. Armer of Lancaster, Kathy, wife of Dennis Maurer of East Petersburg and Julie A, wife of Robert Crnkovich of Lancaster; his brother Kenneth C. Mann of Orange, CA, and 8 grandchildren and 10 great-grandchildren. His sister Mary Lou Sides preceded him in death. The Frey Family thanks Liz, Kathy, Debbie, Justine, Dr. Wright and the rest of the staff at Hospice & Community Care for the exceptional care they gave to Pinky. A Mass of Christian Burial will take place 11 AM Tuesday, February 5, 2019 at St. Joseph Catholic Church. Viewings will be held 6-8 PM, with the Holy Rosary prayed at 7:30 PM, Monday, Feb. 4th at the Charles F. Snyder Funeral Home & Crematory, 441 North George St., Millersville, PA 17551, and 10-11 AM on Tuesday at the church. Interment with Military Honors accorded will be in St. Joseph New Catholic Cemetery. Please omit flowers. Memorial contributions may be made St. Joseph Catholic Church, 440 St. Joseph St., Lancaster, PA 17603 or to Hospice & Community Care., P.O. Box 4125, Lancaster, PA 17604-4125. So sorry to hear of the passing of a very special man who we know will be truly missed. May you find comfort in your love and fondest memories of him. You have our deepest sympathy. I was so sorry to hear the sad news. I have lost a great and dear friend. My sympathy to you and your family. Our thoughts and prayers for Aunt Nancy and my cousins, Nancy, Susie, Kathy, Julie, very sorry to hear about Uncle Pinky, great memories, he will be missed!